Unaiza Ali Barlas, a 20 year old Pakistani student has beaten a Guinness World Record for the longest cartoon strip (individual). Her name has been registered in the Guinness Book of World Records on 12 March 2017. 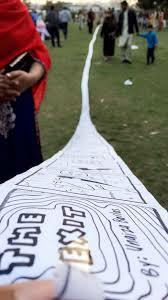 A student of Roots Ivy International Schools, Unaiza made a 267.38 metres long cartoon strip in Lahore, which is officially recognized as the world’s longest comic strip. She officially surpassed the previous record which was held by India’s Narayan Debnath. Unaiza is a passionate artist and has already found an NGO called ‘Art for Humanity’, which raises charity for Edhi Foundation. Having done her A-Levels from Roots Ivy, Unaiza completed her comic strip in almost a year through tiring and selfless efforts, in a bid to bring respect, dignity, and identity to Pakistan with her art. “There’s a character named Jack, which is all about self-actualization initially. He wanted to achieve his own personal goals, get out of the comic strip and live his own life. After he meets new challenges, he learns to not just dream about his fantasy world of his own, but to excel in his current circumstances and help others in doing so”. She says that the theme behind her comic strip is selflessness, and that she wants to project this message to the youth of Pakistan. To get the record, Unaiza needed to get an 877 feet long canvas. However, that was out of the realm of possibility. So here’s what she did instead – she took sheets of paper, cut them and joined them together and made the precise boxes in which she drew the cartoons neatly. After much hard work and effort, she finally managed to surpass the record. “My passion is art, my art is Pakistan, I’m Pakistan. Pakistan Zindabad”. “Unaiza, a young, talented student of ours, was always very compassionate about humanity. Drawing comic strips and creating comic characters was a natural passion for Unaiza. I often used to see her sitting in one corner of the campus drawing comics”. Just like Unaiza, we all need to put in our efforts to make Pakistan great again. Nothing is impossible, if we’re determined. Well done,, ALLAH pak mazeed taraqqi dy. Good Work Keep it up !!!! This sounds an awful lot like an ad for Roots. This is an individual record, so why bring up where she did her A Levels from? She’s 20 now and not even a student of Roots anymore. Did her being a student of Roots have anything to do with her breaking the world record? Nice try, Roots PR department, but it’s apparent. Although I agree with you to some extent but I assure you this post is not paid…. Not good. Apni akhirat ky liye kya tayyari ki? Jahan hamesha rehna hai. This is a very big step towards aakhirat. She has founded an NGO that raises funds for Edhi Foundation. You made us different in rest of the world. Koi picture hoti to yar kuch to samaj ata k usne kiya kia hai? Good..but what the purpose of this record? I am sure there are many people in Pakistan (forget the world) who can make way longer cartoon strip then this..its more like getting into limelight and get other offers..